'Joe-Pye weed'. It's the common name given to several species of the genus Eutrochium. 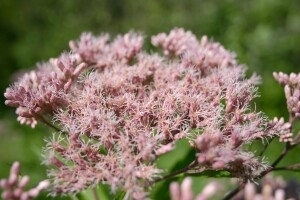 Many of us know these flowers as members of the genus Eupatorium. Just last year, based on chloroplast DNA analysis, it was proposed that Eupatoriadelphus should be treated as a distinct genus and that the earlier name, Eutrochium, be applied to the Joe-Pye weeds. Joe-Pye weed is a member of the aster family, Asteraceae. 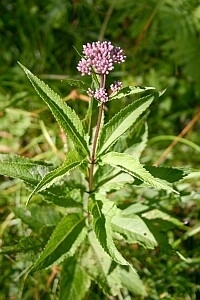 In this area of central New York State, four species can be found: E. dubium (Joe-Pye thoroughwort), E. fistulosum (hollow Joe-Pye weed), E. maculatum (spotted Joe-Pye weed), and E. purpureum (sweetscented Joe-Pye weed). This article will focus on the more common one in our area, E. maculatum var. maculatum, spotted Joe-Pye weed. Eutrochium maculatum likes wet soil conditions and is a common sight in our calcareous fens, wet meadows and thickets. Besides reproducing by seeds, this perennial herb spreads by rhizomes and is sometimes found in large colonies. The stem often has dark purple specks, from which it derives part of its common name, although it may be solid purple. The other part of its name is said to derive from a Native American doctor who used the plant to cure fevers in colonial times. The stem is pubescent, not glaucous. Most eye-catching are the four (sometimes three) or five whorled leaves surrounding the stem. The leaves are coarsely dentate, lanceolate, and 2 1/2-8" long. The flowers are borne in flat-topped inflorescences, 4 to 5 1/2" wide. The fuzzy pinkish-purple clusters, consisting entirely of disk flowers, are frequented by nectar-seeking insects such as butterflies, bees, dragonflies and wasps. Under the right conditions, the plant can grow to a height of seven feet. The plants emerge in early June, but do not begin flowering until mid-July. They reach their peak in mid August. The entire plant is known historically as an alternative medicinal for various purposes. The leaves, when crushed, have an apple smell and, when burned, are said to repel flies. A concoction made of the tea from the roots or flowers can reputedly cause sweating and was used by the early settlers to break fevers. Our native white-tailed deer and eastern cottontail will feed on the whole plant and turkeys, mallards and the white-footed mouse will eat the seeds. The flowers are attractive and are usually carried in nurseries for they make appealing garden plants. The bud clusters are colorful, even before opening, and they are long-blooming afterward. Because they are heavy pollen-bearers, perhaps their greatest commercial appeal is their ability to attract large, showy butterflies like swallowtails and monarchs. For additional photos, click on the plant name in the box on the right.